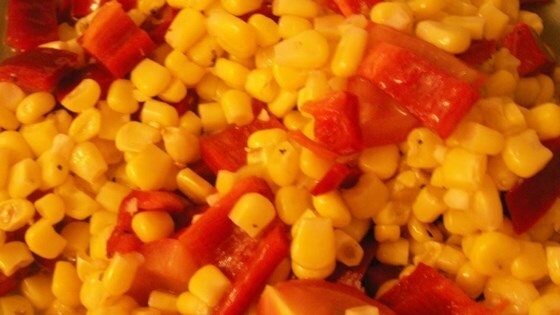 "This simple recipe is a great use for leftover sweet summer corn on the cob. Light and quick, it's a great addition to summer meals." Place the corn in a large pot with enough water to cover, and bring to a boil. Cook 5 minutes, until kernels are tender but crisp. Drain, cool slightly, and use a knife to scrape kernels from the cobs. In a large bowl, mix the corn kernels, red bell pepper, onion, tomato, olive oil, balsamic vinegar, and garlic. Season with pepper. Chill 15 minutes before serving. loved it and my husband loved it too. used frozen sweet corn kernels as that's what i had. still tasted great :) thanks for sharing! This was a delicious way to use up left over corn on the cob. It could be mistaken for a relish! Next time I would ease up on the onion! I served it with grilled sausage and it was a great combo. Nice little summer salad. Added a bit of sugar and left out the tomato. Used fresh ears of white corn. Great way to use a bumper crop of tomatoes & corn this summer.